The pallets are like that wishing well or that lamp jinni as they are making the wishes and desires of the common people come true and that too without costing them an arm and leg. Anything and everything that comes in the range of home furnishing and decor can be yielded from the pallets. And here on the DIY projects you can get to see all the achievements made from the recycled pallets in the furniture and decor perspectives needed for a house. 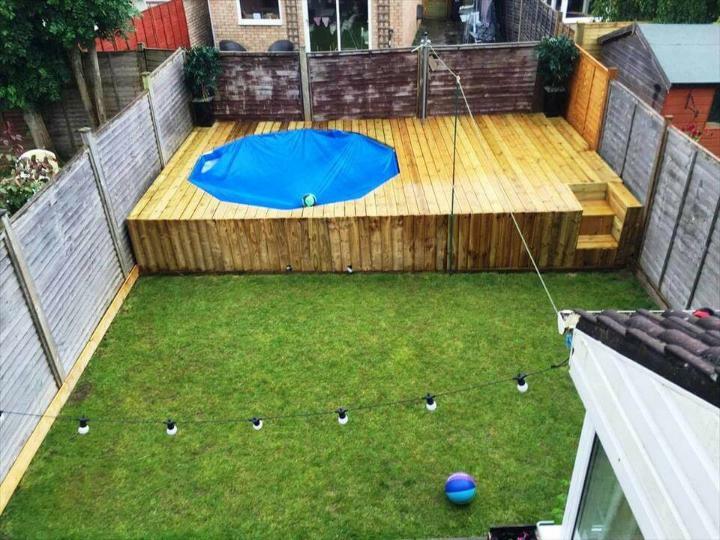 Every homey person has a dream to see a swimming pool in his outdoors where he can enjoy the cool dives to beat the heat effect of the summers with his wife and kids. The joy one feels in the cold of swimming pool especially the kids is just priceless and so relaxing too. 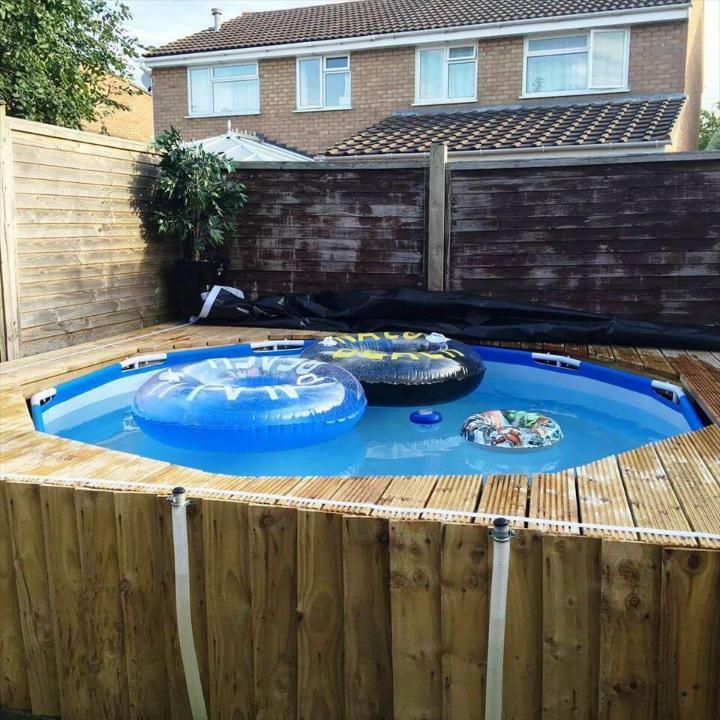 And now the pallets would make your dream come true to have a nice swimming pool in your garden or yard where you can hang out for hours and feel immense pleasure. 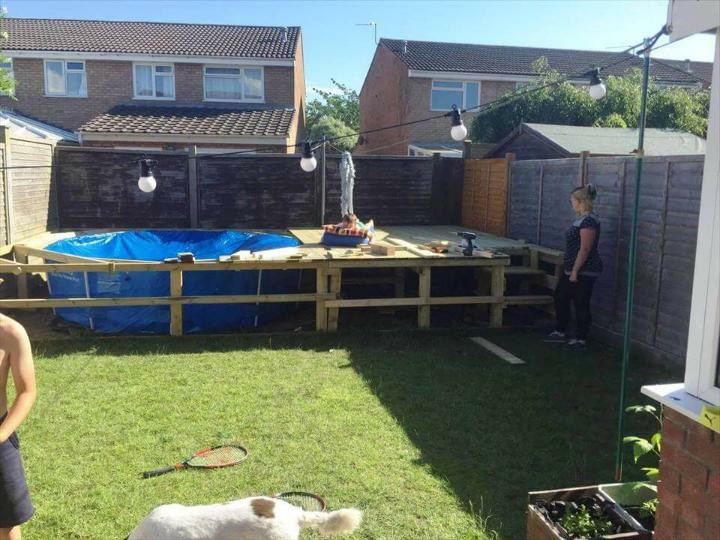 Just have a look at this DIY above ground pallet swimming pool for the outdoors installed with the use of a heap of pallets, some metal pipes and a tarp in octagonal design. It also shares a small deck area t the right where you can sit and rest after getting tired from the long swimming hours or keep and eye on the kids who are enjoying in pool. 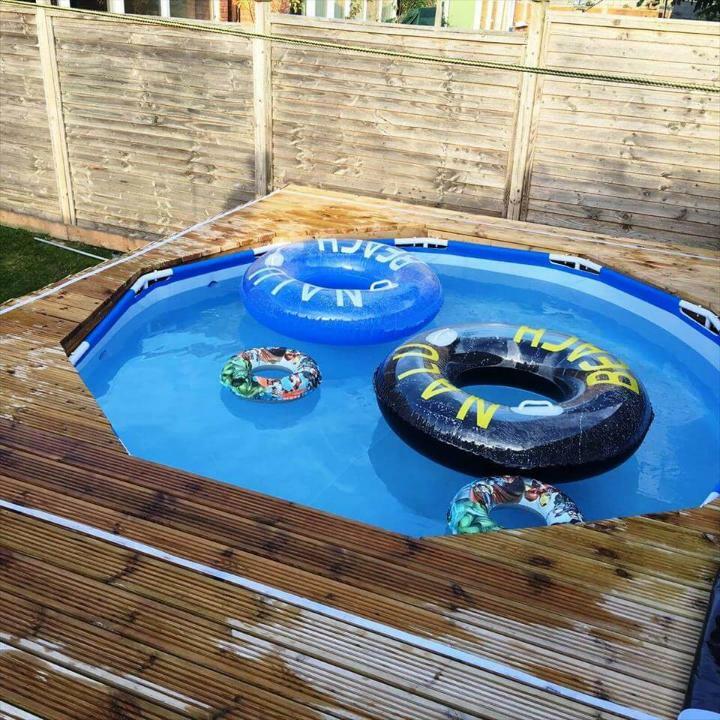 The whole pallet structure has been given a protection layer of wax and oil from the water so that this awesome pool stays with you for ages. 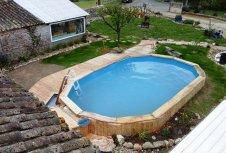 To shape up this swimming pool with a shared deck area of small size lots of pallets are requires. First of all a metal pipe stand of octagonal shape has been given a lining of the taro and then provided with a pallet slat surrounding of the same octagonal design. 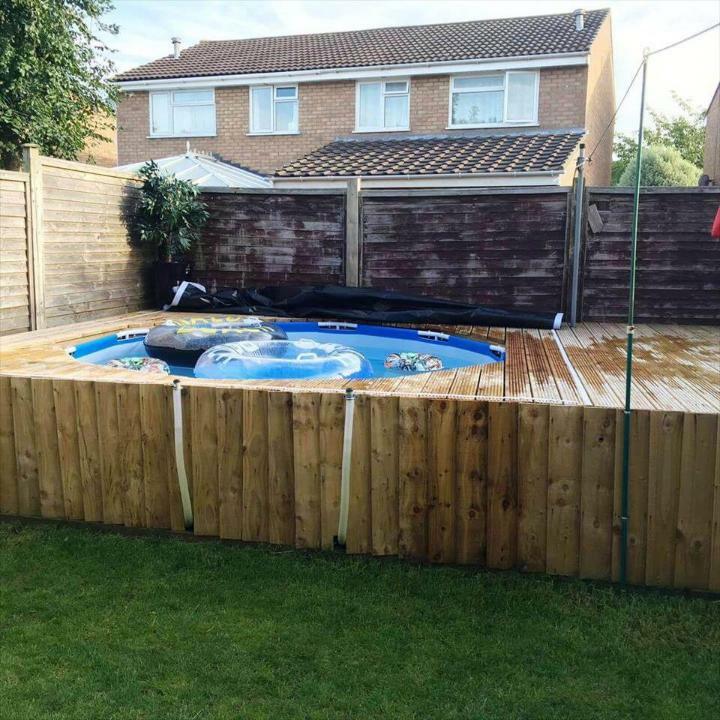 In the second step the whole pallet swimming pool and deck area has been filled with the pallets on the top and the front side have been covered with a boundary installed from the vertical stacking of the pallet slat pieces in a very tight manner. 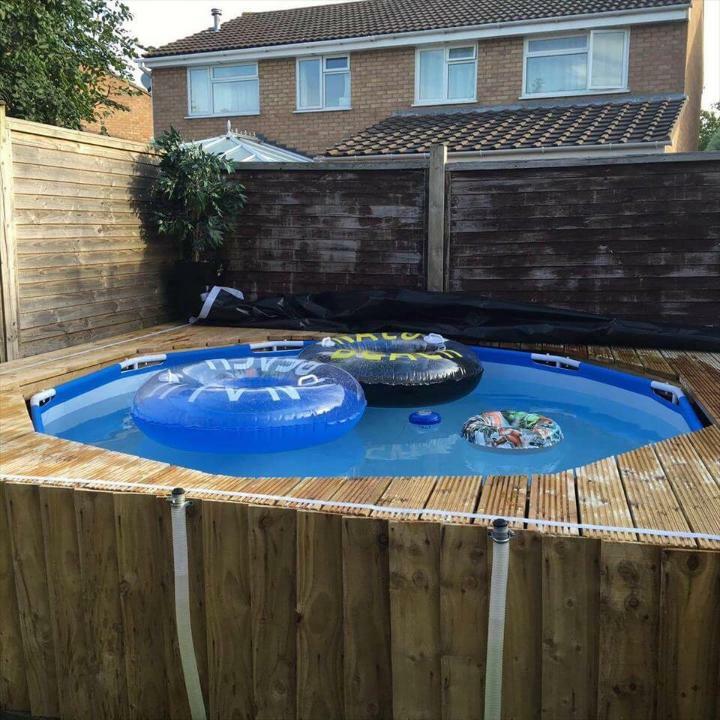 Two plastic pipes have been managed to get through the front pallet made side and have been ringed to the top to hold and use for the drainage of the pool to provide it cold and fresh water every time you want to dip in. 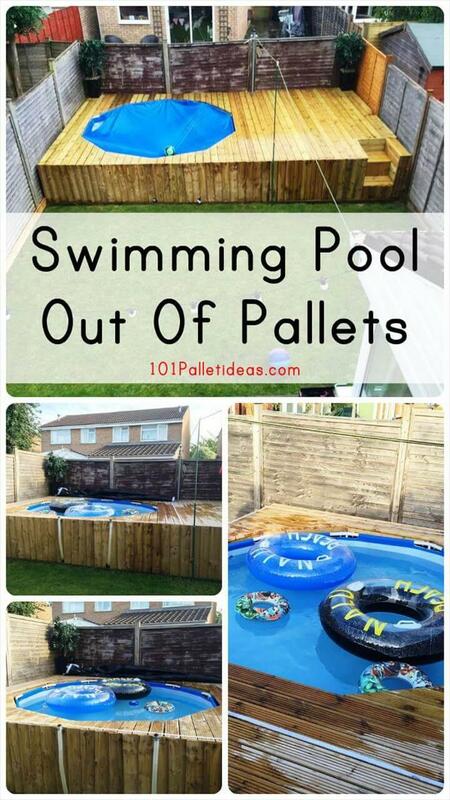 The swimming pool would demand a handwork of few days with the pallets and your tools as you would have cut and dismantle pallets in to a load of slat and plank piece to complete the whole structure. The outer area of the swimming pool has been filled up with the pallet slats in such a clever that they give us illusion f the gorgeous patterned lines on the wooden surface level. Not only the swimming pool to enjoy cold dives in the hot summer weather but you would also enjoy the small deck area so that you can sit there and enjoy the fun movements of the kids in pool. The pool has been also provided with the two stair steps at the right side to let you all climb easily and enjoy it. 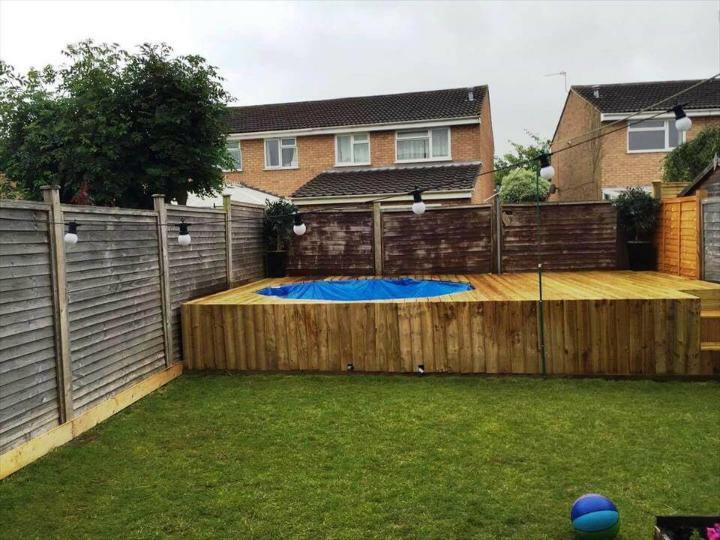 The whole pallet project in the picture has been coated with weather resistant so that the wood does not easily get clumsy with wet effects of water.